Today the Kitsap Public Health District issued a cyanobacteria warning for both Kitsap and Long Lakes. 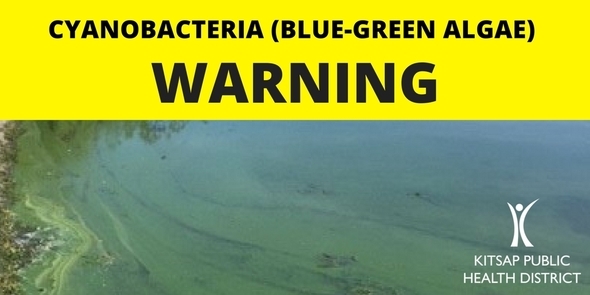 The public should to avoid all contact with lake water in both lakes due the presence of toxic cyanobacteria – also known as blue-green algae. Avoid all contact with the lake water until further notice. This means no swimming, wading, or types of water play where water could be swallowed or get in the mouth, nose or eyes (especially in areas where the algae are concentrated). Avoid ingesting lake or stream water. If a resident draws lake water for drinking purposes, they are encouraged to drink bottled water until further notice. Limit access of pets and livestock to the lake. Avoid consuming fish caught during the algae bloom. Rinse boats and trailers thoroughly before going to another lake. No illnesses have been reported to Kitsap Public Health at this time. Warning signs are posted at public-access areas and roadsides around the lake. Residents who live near lakes or people visiting the lake are encouraged to look for cyanobacteria blooms and contact Kitsap Public Health at 360-728-2235 when blooms are observed.